School sings the praises of DEL cover. 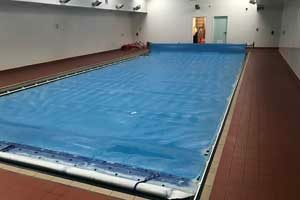 When St Wilfrid’s Academy heavy, cumbersome foam pool cover needed to be replaced, its new DEL cover from Bolton pool specialist Pool Tech did more than just save them time. At the primary school in Standish, near Wigan, its older foam cover was proving to be a problem. Its immense size and weight were putting staff members at risk of accidents and strains. 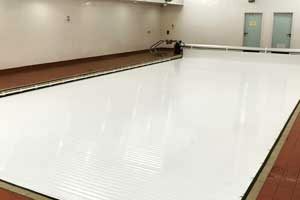 As a result, whenever the pool was to about to be used or had just been used, three strong members of staff were required to move the cover. That’s not a practical solution in a busy school, so, for the majority of the time, the cover, which was designed to keep in heat and water, was left off. Worried about the wellbeing of their staff, as well as the wasted energy, the academy contacted Bolton-based Pool Tech Services. A specialist in commercial installations, the company works with schools, health clubs, and leisure centres on new installations, as well as refurbishments. After assessing St Wilfrid’s pool and consulting with staff about their needs, Pool Tech recommended an automatic cover solution. By fitting a motorised cover, with push-button operation, the primary school could eliminate the health and safety risks, while ensuring that opening and closing the pool could be done quickly by a single member of staff. And, by making it easy for staff to cover whenever the pool wasn’t in use, the school could ensure that no unnecessary heat or water was wasted. During the February half-term, Pool Tech’s team installed a DEL Dune cover to its 30-metre pool: the biggest ever installed in the UK to date. The ultimate in fully customisable solutions, it features hard-wearing PVC slats, advanced tubular motors, supported by two powder-coated aluminium units resistant to bumps and scrapes. Rose Crompton, the Finance Director at St Wilfrid’s Academy, is already feeling the benefits. She said: “While it’s still too early to say exactly how much it has saved us, we’re confident that, in the long run it will save us a lot. The previous cover was so difficult to use. Staff really appreciate how simple the DEL is to operate.